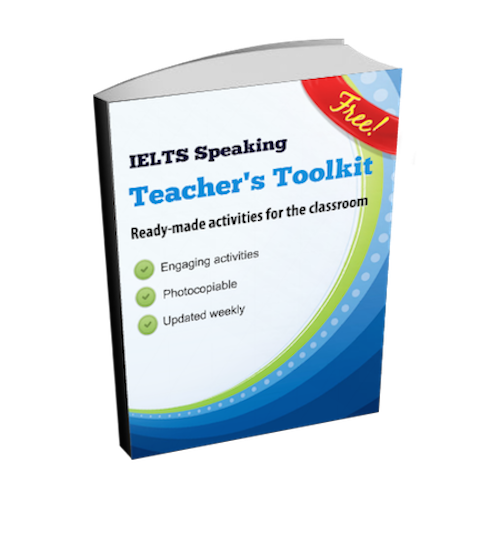 Sign up for our FREE photocopiable resources for your IELTS Speaking lessons, delivered weekly by email. Do you run IELTS Speaking classes? Are you on the lookout for ideas and activities for your lessons? Would you like to receive FREE, weekly materials to photocopy for your classes? If you’re looking for engaging and effective Speaking activities for your IELTS classes then we think you’ll love these weekly updates. Whilst the focus of these materials is on IELTS, many of the resources can be used in general Speaking classes of for other exams such as FCE or CAE. What’s the catch? Why are we doing this? There’s no catch! We think the materials on this website are useful for students preparing for the IELTS Speaking exam. And we think the best people to tell students about our materials are teachers like YOU! So by offering you free materials for your lesson, we hope you’ll recommend this website to your students. Each week we’ll send you an email with a link to a page where you can download the latest documents. It’s as simple as that!